Shaw University, founded as the Raleigh Institute, is a private liberal arts institution and historically black university (HBCU) in Raleigh, North Carolina, United States. Founded in 1865, it is one of the oldest HBCU in the Southern United States. Shaw University has been called the mother of African-American colleges in North Carolina, as the founding presidents of North Carolina Central University, Elizabeth City State University, and Fayetteville State University were all Shaw alumni. The founder of Livingstone College studied at Shaw, before transferring to Lincoln University. What became North Carolina Agricultural and Technical State University was located on Shaw’s campus during its first year. Shaw University is affiliated with the General Baptist State Convention of North Carolina and a member of the National Baptist Convention, USA, Inc. which supports the Shaw University Divinity School. Along with Howard University, Hampton University, Lincoln University, PA and Virginia Union University, Shaw was a co-founding member of the NCAA Division II's Central Intercollegiate Athletic Association (CIAA) Conference, the oldest African American athletic association in the U.S. The university has won CIAA championships in Football, Basketball (women's and men's), and Men's Tennis. The university won a 5-year grant with University of North Carolina-Chapel Hill to create a Partnership for the Elimination of Health Disparities for minorities, and a 7-year grant with Johns Hopkins University for Gerontological Research. In 2007, Shaw received $2.5 million from the National Science Foundation to support its Nanoscience and Nanotechnology program. In 2004, Shaw University received $1.1 million from the U.S. Department of Education to develop an Upward Bound Program. Shaw University is accredited by the Southern Association of Colleges and Schools, the Council on Social Work Education, and the American Psychological Association. The Divinity School is accredited by the Association of Theological Schools in the United States and Canada as its Allied Health Professions programs are accredited by the Commission on Accreditation of Allied Health Education Programs, the Commission on Accreditation of Athletic Training Education, and the National Council for Accreditation of Teacher Education.The University offers undergraduate degrees in natural science, business and accounting, religion and philosophy, education and computer science. The University also offers graduate programs in Divinity, Religious Education and Early Childhood Instruction. The Center for Alternative Programs in Education (CAPE) has centers in Greenville, Kannapolis, High Point, Rocky Mount, Ahoskie, Fayetteville, Durham, Wilmington, and Asheville. The school was founded by the American Baptist Home Mission Society. Henry Martin Tupper came south immediately after the end of the Civil War, establishing the Second Baptist Church of Raleigh (changed to Tabernacle Baptist Church in 1910, and now the Tupper Memorial Baptist Church.) Later Tupper and his Bible study students constructed a two-story church, with one story for the church, and one for the Raleigh Institute, where he taught freedmen. By 1915, supported by the American Baptist Home Mission, the school had 291 students, evenly divided between men and women. In 1867 the school consisted of three buildings, two of which were Antebellum cabins. As of 1875 when Shaw Collegiate Institute became Shaw University only two major structures existed – The Shaw Building and Estey Seminary. 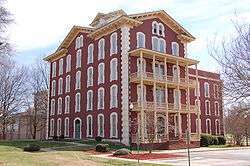 The former, erected where once stood corn fields in which Tupper hid from lynch mobs, with a 165-foot frontage, four stories high and possessing a tower, was the most commodious school building in all of North Carolina at that time. It provided instruction services, a library, and lodging. The seminary, reputed to be the first building ever erected for the education of African-American females, was devoted to training women in cooking, sewing, music, and the like. Henry Martin Tupper bought the material from which the women made garments and he himself sold the garments in an effort to pay for the cost of the material and other expenses. In 1879, a third major building was erected – a chapel and dining hall called the Greenleaf Building. It was named for O.H. Greenleaf of Springfield, MA, a yearly liberal contributor. The upper part of the building was accessible by stairs. Doors on either side of the tower provided entrance to the dining room. At the right of the chapel was a small room and at the left a library. A storeroom existed under the stairway. Funds saved from the school were used to build this structure. These were augmented by contributions of $650 (15,116.28 in current dollars) from O.H. Greenleaf, Captain Ebenezer Morgan, and Deacon O.B. Grant of Stonington. It was renamed Shaw Collegiate Institute after Elijah Shaw, benefactor of Shaw Hall, the first building. In 1875, it became Shaw University. In 1873, Estey Hall was built, marked the first female dormitory on the campus of a co-ed school in the United States. In 1866 when the Raleigh Institute was first being developed, Tupper had hoped to open a medical school; in 1881 the medical building became a reality, $15,000 (220,588.24 in current dollars) was contributed to make it. The medical school complex consisted primarily of three structures – a four story medical dormitory built to accommodate 75 men and erected around 1880 when the trustees approved the establishment of a medical department; the Leonard Medical Building, erected in the summer and fall of 1881 and containing lecture rooms, dissecting rooms, an amphitheater, and opened for its first session on November 1, 1881; a 25 bed hospital which opened for the reception of patients on January 10, 1885. It was the first four-year medical school to train African-American doctors in the South. On December 11, 1888 the university opened their law school. The full curriculum offering at Shaw are unknown, but it was the only black law school that had a course in legal shorthand. The course was offered on the premise that such a skill would broaden the opportunities for a black lawyer to work in a legal firm in a clerical position or as an office assistant should discrimination impede their ability to practice law. Shaw University graduated fifty-seven law students before it closed in 1916. It graduated fifty-four law students between 1891 and 1914. North Carolina politician John S. Leary was an important figure in the founding of the law school served as its dean starting in March 1890. He was followed as dean by Edward A. Johnson, who was the law school's first graduate and later the first African-American member of the New York State Assembly. Leonard Medical School was founded in 1881 as the first four-year medical school in the South to train black doctors and pharmacists. The first medical school in the state to offer a four-year curriculum, it operated until 1918. Given their importance in United States educational history, both Estey and Leonard halls have been listed on the National Register of Historic Places. 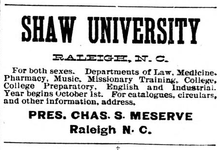 An ad for Shaw University from 1900, placed in a black-owned newspaper in Minnesota. By 1900, more than 30,000 black teachers had been trained. In 1968, Shaw University became the first black college to own a radio station. At first the station used an antenna on top of a building on the downtown campus, but in the late 1990s a new tower was built in southeast Raleigh near Interstate 40. WFSS in Fayetteville, North Carolina moved from 89.1 FM to 91.9 FM to allow WSHA to increase power. The Student Nonviolent Coordinating Committee (SNCC) /ˈsnɪk/ was one of the organizations of the American Civil Rights Movement in the 1960s. It emerged from a student meeting organized by Ella Baker held at Shaw University in April 1960. SNCC grew into a large organization with many supporters in the North also. By the mid-1980s, enrollment declined and the university was deeply in debt. President Talbert O. Shaw (1988–2003) (not related to the namesake) increased the student body from 1,600 to 2,700, restructured debt and created the Raleigh Business and Technology Center. In the 1990s, Shaw ran a successful capital campaign to renovate historic buildings and construct new campus facilities, including the Talbert O. Shaw Center for Teachers' Education. In 2005, SUDS received a 10-year accreditation from the Association for Theological Schools and began construction on the Center for Early Childhood Education, Research and Development. Another example of new directions is that the university is collaborating with the University of North Carolina at Chapel Hill on a Partnership for the Elimination of Health Disparities Center. As noted by Daniel Howard, center co-director at Shaw University, establishing the research resources at Shaw, meant that "more African American college students can become health researchers, which is a definite plus when trying to eliminate disparities." Shaw University is also a member of the Cooperating Raleigh Colleges (CRC) Program. This intercollegiate program is a consortium to pool resources of courses and programs, material, and professors for the sake of providing effective education to all the students. The participating colleges are Shaw University, North Carolina State University, Saint Augustine's College, Wake Technical Community College, Peace College, and Meredith College. Shaw University led a research study to investigate why no black veterans of World War II had been awarded the Medal of Honor. The study concluded that racial discrimination had contributed to the military's overlooking the contributions of black soldiers. The 272-page study recommended ten soldiers whose military records suggested they deserved the Medal of Honor. In January 1995, the team's findings were sent to the U.S. Department of Defense. In April 1996, the department agreed that seven of the ten soldiers should be awarded the Medal of Honor. All ten had been awarded other medals during the war years. President Bill Clinton awarded the Medals of Honor on January 13, 1997. The department's decision in response to Shaw's study marked only the third time that the military re-evaluated military records to award the Medal of Honor. Only one of the seven nominees, 1st Lt. Vernon Baker of St. Maries, Idaho, was alive to receive his medal. Those who were awarded the Medal of Honor posthumously were: 1st Lt. Charles L. Thomas of Detroit, Michigan; Pvt. George Watson of Birmingham, Alabama; Staff Sgt. Edward A. Carter Jr. of Los Angeles, California; 1st Lt. John R. Fox of Boston, Massachusetts; Pfc. Willy F. James Jr. of Kansas City, Kansas; and Staff Sgt. Ruben Rivers of Tecumseh, Oklahoma. Shaw University is a member and co-founder of the National Collegiate Athletic Association Division II's Central Intercollegiate Athletic Association (CIAA) Conference. Shaw University's Basketball team participates in the CIAA annual Basketball Tournament, which is the third most attended athletic event in collegiate sports after the Atlantic Coast Conference and Big East tournaments. Shaw fields 14 varsity athletic teams including teams in men's basketball, women's basketball, football, tennis, baseball, cheerleading, men's and women's track and field, volleyball, golf, and bowling. The athletic teams are known by the "Bears" nickname. In 2002, Shaw University's men's basketball team won the CIAA championship. Also, the ladies' basketball team won the 2008 CIAA championship. The football team, reestablished by Clarence G. Newsome in 2002, played at Durham County Memorial Stadium in Durham, North Carolina, through the 2008 season. In 2009, the team relocated their home games to Millbrook High School in Raleigh. The 2011 season will be played at Durham County Stadium. It won the CIAA football championship in 2004, 2007, 2008, and 2010. The football team has also made the Division II playoffs in 2007 and 2010. Also in 2011 both men's and women's teams won the CIAA Tournament making Shaw the last school since Norfolk State in 1975 to win the big three championships in the same year. Shaw's Lady Bears won the NCAA Division II Championship for the 2011-2012 season. The Shaw University Lady Bears have won the CIAA Tournament for four years in a row. Their most recent win occurred on March 1, 2014. The University has a range of student organizations, including sororities and fraternities, and honor societies. Shaw's marching band, better known as "Platinum Sound", was reestablished in the Fall of 2002 along with the reestablishment of the football team. The band has grown from 80 members in 2002 to over 130 members. Shaw's marching band has participated in the Honda Battle of the Bands at the Georgia Dome in Atlanta, Georgia. Also, several Shaw student-musicians played the sounds behind the 2002, Twentieth Century Fox motion picture, Drumline. Shaw University consists of 32 buildings and nine additional campuses across the state of North Carolina. As of July 2011, Durham County Stadium will remain the home of the Shaw University Bears football team until construction plans towards building a new facility on Shaw Farm(a 40-acre lot donated to the University under James Cheek's administration on Rock Quarry Rd. in Raleigh NC and the site of the National Alumni House) is completed and implemented. The main campus is located in the heart of downtown Raleigh. Five of the thirty-two buildings are national and state historic landmarks which are the Frazier House, Estey Hall, Tyler Hall, Leonard Hall, and the Rogers-Bagley-Daniels-Pegues House. The University has a memorial garden in the heart of the campus which is also the location of the tombs of the founder of Shaw University, Henry Martin Tupper and his wife Sarah and the University bell tower, that was erected in honor of those who came and left the University, from its founding to its present. The University has three libraries, the James E. Cheek Library, the TOS Education Library, and the G. Franklin Wiggins Library, that houses over 210,000 volumes, 10,000 ebooks, many other sources of scholarly and cultural literature and microforms, located throughout Shaw University (including CAPE sites). The Raleigh Business and Technology Center is located on Shaw's campus. Planned in 1989, Shaw University city council officials and Saint Augustine's College in a joint effort built the current facility on Shaw's Campus. Both colleges use the center for classes and community programs. The Campus has four dorms, the Flemming-Kee Men's Dorm, the Dimple Newsome Dorm, Talbert O. Shaw Men's Dorm and the Talbert O. Shaw Women's Dorm. Other resources available on or adjacent to the campus are McDonald's, The Willie E. Gary Student Center which houses the Bear's Den (Game Room and Grill), and the Cyber Cafe'. As a result of the massive destruction of the Mid-April 2011 Southern United States tornado outbreak, the university cancelled classes for the semester. As a result of the storm, two dormitories, the student union, and the roof of Estey hall were severely damaged. There were minor injuries but no one was seriously hurt. Ezekiel Ezra Smith 1880 U.S. Ambassador to Liberia (1888–1890) and President of Fayetteville State. Henry Plummer Cheatham 1883 Republican member of the United States House of Representatives from 1889 to 1893. James E. Cheek 1955 Former President of Shaw University, President Emeritus of Howard University, 1983 recipient of the Presidential Medal of Freedom. Edward A. Johnson 1882 First African-American member of the New York state legislature when he was elected to the New York State Assembly in 1917. Benjamin Arthur Quarles 1931 Historian, administrator, scholar, educator, and writer. 1 2 "About Shaw University". Archived from the original on February 13, 2008. Retrieved March 1, 2008. ↑ "CAPE Adult Degree Program". Shaw University. Retrieved April 23, 2014. ↑ "Tabernacle Baptist Church official website". Archived from the original on May 9, 2008. Retrieved May 29, 2008. ↑ Emancipation. Retrieved 15 August 2015. ↑ Anderson, James D. (1988). The Education of Blacks in the South, 1860-1935. Chapel Hill: University of North Carolina Press. pp. 244–245. ↑ "Carolina-Shaw Partnership for Elimination of Health Disparities". Retrieved March 27, 2008. ↑ "Historical Perspective". World War II Study. Shaw University. Archived from the original on April 22, 2008. Retrieved May 29, 2008. ↑ "Shaw University To Play Football At Millbrook High School". Retrieved January 5, 2010. ↑ "CIAA". CIAA. Retrieved 15 August 2015. ↑ "Shaw University students to compete in quiz-bowl tournament". newsobserver. Retrieved 2016-06-08. ↑ "Shaw Campus Hit By Raleigh Storm; No Injuries". News & Events. Shaw University. Retrieved November 5, 2012. ↑ McClaurin, Irma (April 17, 2011). "Message from President McClaurin: A Prayer for Hope in the Face of Disaster" (PDF). Shaw University. Retrieved November 5, 2012. ↑ "Full text of "Shaw University Bulletin: Alumni Number with Founder's Day Announcements"". Retrieved 15 August 2015. ↑ "Gladys Knight Biography". Retrieved 15 August 2015. ↑ Adam Clayton Powell. "Adam Clayton Powell - Notable Names DataBase (NNDb)", Notable Names Database, September 11, 2001. Accessed March, 2014. ↑ Shaw U Alumni. " Shaw University - Notable Names DataBase (NNDb)", Notable Names Database, Accessed March, 2014. ↑ Presidents & Chancellors. "NC A&T Library", May 29, 2009. Accessed March, 2014. ↑ ITS Web Services. "Past Presidents and Chancellors". Retrieved 15 August 2015. ↑ Martin, Douglas. "Lucius Walker, Baptist Pastor for Peace, Dies at 80", The New York Times, September 11, 2010. Accessed September 12, 2010. 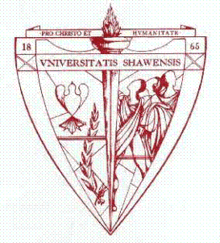 Wikimedia Commons has media related to Shaw University.